I thought I would drop in and give you an update on my goals. In case you missed it on instagram. 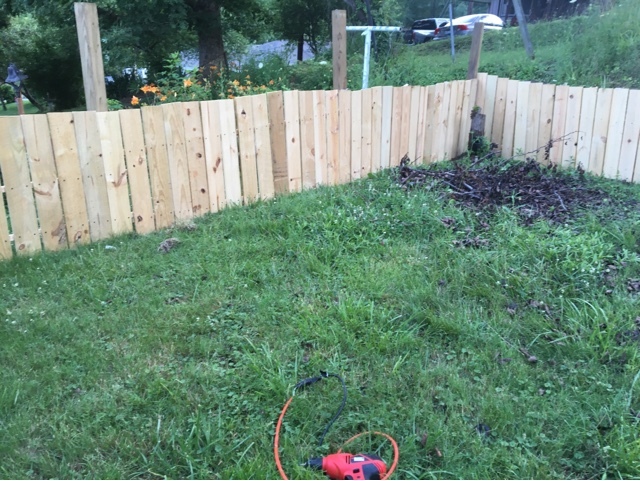 The fence is finished. well....It still needs to be stained, but the structure is up. First time I opened the door and didn't latch Max and Westley's leashes they just stared at me like "ummm mom your gonna get us killed. Latch us right now." They seem to like it. Its been really hot and humid. Think melt your face off while your hair clings to your head in wet limp strings. So they've played it smart and have stayed in using the puppy pads. But I predict they will love it. Blog more- Honestly I have tried. I have stuff to say, but trying to get the fence done was exhausting. I would come home every evening and work until dark. I still have a to-do list a mile long. Hoping I can get caught up this weekend. Walk- My target goal is 60 miles. So far I have walked 6. Budget- Nope still haven't done it. 1. I have no idea what I'm doing. This is not and will never be a construction/home remodeling blog. My grandfather owned his own construction company, and I was his favorite (followed closely by my sister) As his favorite I was at his house all the time. That had little to do with being his favorite and more to do with, we lived next door. Anyway, I think I must have picked something up from just hanging out while he talked work. Because the hardest part was digging the holes. 2. 6 trips to lowes, 5 drill bits, 4 various size boxes of screws, and more cuss words than even I care to admit to and I realize I really needed help, and access to a truck. Although I do have new found respect for the Focus trunk space. 3. Did I mention I had no idea what I was doing? 4. Am I even a blogger? These pics are terrible and not at all staged, or even have the trash cleaned up. 5. Don't forget all of this will be stained. Ok, anyway here ya go. So as you pull into my driveway, you see this. The small fence on the side is the gate. I didn't want people to have to pull on a giant gate, the big panel with have an awesome barn quilt square. I just have to have time to make it. 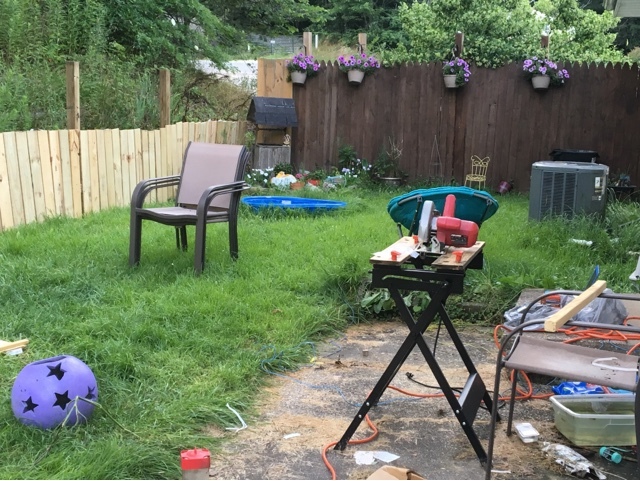 So disregard the mess, I literally took this as soon as I finished so my saw, and crap is all still out and my yard needed mowing, but I was too busy to mow. Its now at a height that my dogs don't get lost in. 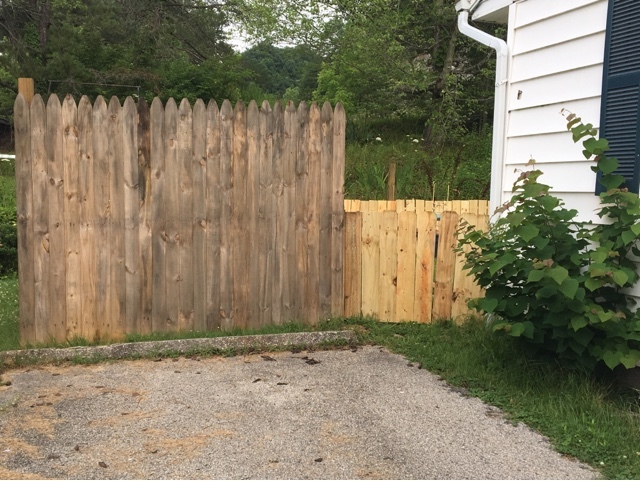 On the other side of that tall fence is literally the busiest road in Morehead, That privacy panel was a priority so It got finished last year. I had a pear tree where that pile of dead leaves are. But it got cut down and the tree laid there for weeks before I finally cut it up and drug it to the curb. I forgot to tell Hannah that there was a partridge (stuffed) in the tree and she nearly had a heart attach. It was funny. View of the gate. 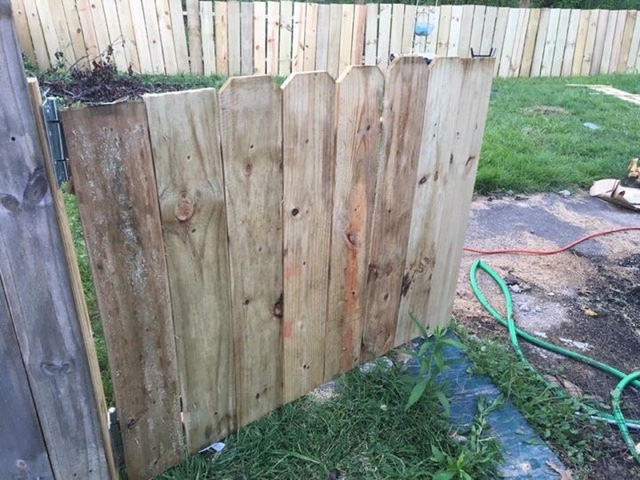 I am probably most proud of this, and it inspired me to make puppy gates for inside the house. They are still a work in progress. One tip I would give you other than, ,have help and use a truck to get all your materials in one trip, is when you are digging the holes if you can do it right after a rain, or dig a small started hole and then pour a 5 gal bucket of water on it and let it sit then start digging, you will be glad you did. Trying to dig with it dry was extremely hard and I hated every single second of it.